Ever since my experience on the train I have resorted to sleep. Dreams have become my reality since reality clearly wasn’t meant to be mine. Since the understanding that not only can I never know how the worlds of others look, I can’t even understand my own if I keep busy with everybody else’s. That is why dreams have become my world. I learned how to control them. Semi-control them at least. There’s a black leather book by my bedside where I jot down, as quick as I can, the memories of them. Visions of worlds experienced through sleep and imagination, maybe even truer than what I see when awake. Sometimes I can’t tell the two apart. Sometimes it feels as if the world awake is the nightmare and my dreams are a resort where I come to rest my weary head, and after a long day I can now finally turn back to peace. As my eyes fall to rest I wake up in a town. 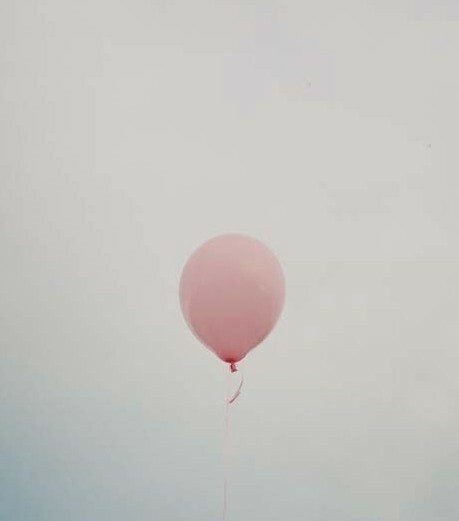 With no one to be found in the streets I look around my dreaming person and spot a childish pink balloon in the distance. It appears to be moving towards me slowly. After a short while it takes place besides me and stops, as if it has a mind of its own. Almost seeming to make eye contact it moves away and I follow. I follow a balloon through streets I vaguely remember somehow. We pass one street after another, all the houses looking the same. We arrive at a forest with magnificent trees. Green. Yellow. Red. All the colours possible are present. The trees guarding over us in their towering height, but not with intimidation. The rustling of leaves and cracking of twigs under my feet brings me joy and I kick wildly, swinging heaps of leaves high up in the air. I laugh, and it seems as if the balloon laughs with me. Through the forest we pass, wondering where he’ll take me next. A lake appears before us. Placed in the middle of the fantastical forest with a small beach around its circular shape, it looks like the perfect spot to rest. My balloon gives the example and floats onto the watery surface and dances above it. I take off my clothes and suddenly notice how pleasantly warm it seems to be here. I was not cold nor warm in my clothes and neither am I now in just my underwear. I jump into the water and feel its pleasant touch. Floating through we swim for an hour, a day, a minute. I cannot tell the difference. As we come ashore towels have been laid out for our usage. Dried and clothed, my balloon takes me to a new location. I follow to a playground, though meant for children’s usage I am overcome with joy and run into it’s coloured attractions. Through nets I climb and under wooden beams I duck. Pleasure never ending as I notice my balloon watching in the distance. I spot a slide shaped like a tunnel. Its yellow I cannot withstand. I prepare myself for the way down the cheerful tunnel and take one last look at my ballon before I pass through. I fly down. Arms up and smile wide I fly down. It seems to last an eternity flying through this passage of yellow. I let myself go, hoping my balloon will catch me when I drop down. I can see the end and as I fall down I land on my own two feet. In chips of wood I plant them and I look around trying to find him, but he isn’t here. I walk out to the road, look left, nothing. Look right, there he is. In the distance. I take a step in his direction but he seems to move away further with every step I take. I try to walk faster, but to no avail. My balloon keeps his distance. I dare to run, but as I come closer to his presence he rounds a corner and as I round the same, he has vanished into thin air. Lost and not knowing where to go or where I came from I walk back. Surroundings not looking as happily as they used to with my balloon. The temperature seems to drop and I’m getting colder and colder. Clutching myself in an effort to stay warm I pass the playground I vaguely remember. Hard cement has replaced the wood chips from my memory and a strange, twisted feeling comes upon me when I notice the greyish yellow slide. Its paint broken en spiderwebs covering the exit. Temptation is absent this time and I swiftly pass it. I arrive back at the lake, or what remains of it. The water has almost dried up and the soil has cracked in either cold or heat. The small puddle of remaining water looking green as you’d expect an apple to be. At the opposite end I spot a hound. The animal looks filthy with its slender posture and ribs showing. Its fur neither groomed nor healthy and rotting teeth showing as it licks up the remaining water. A small step in its direction and barking off it goes. Into the forest. I turn in a different direction than the animal, making sure I avoid it. I need to find an exit to this world. The forest overlaps my person as the trees, no longer red, or green, or yellow, but now barren of leaves. The cold, fruitless branches looming over me like hands trying to grab my skull. The freezing wind passing through tears up my eyes and I can hardly move. Even though I feel as if my ears are freezing off I can still hear the hound, maybe even multiple in the background. Their swift and slender bodies needing to be fed, their noses sensing a possible prey in me. I look back and see their red eyes hunting for me. Their rotting teeth dripping with saliva, you could smell it from a mile away. I try to outrun the pack, but my legs wont let me. As if tar has stuck to my feet I can barely plant one foot in front of the other and as I try again I fall down. I can feel their breath on my neck as one of them places his paw on my back. I have to wake up, this world of dreams seems not to be mine either.